I want to share some details of a research project that we’ve kicked off this week, exploring ‘Conditions for Community’. This is quite early stage work, building out of some earlier pieces on ‘communities in Social Leadership’, and some of the work on tribes and trust. The project has three key aims:  to understand the conditions in which communities emerge,  to explore the communities that people inhabit, and  to create some principles, guidelines, that we can use as a developmental framework for leaders, to nurture and support the growth of communities. My own language around this is ‘creating fertile ground’, how can leaders create spaces, and conditions, for communities to thrive. This is true of much of my current thinking around the Socially Dynamic Organisation: we are moving from a place where leaders used to have the answers, towards a place where the role of leadership is to hold open spaces, to create conditions, to nurture, to support, with humility, and kindness. Idealistic? Maybe, but we are explorers in a new world. And the old models of leadership through exertion of formal power will not suffice. I’m not yet fully clear what the outputs of this work will be: certainly, i hope for a better understanding of how communities emerge, and possibly some taxonomy of how they are viewed (formal to social, certainly, but possibly segregated in other ways too). I hope, too, to use this to spur development of more calibrated community mapping tools, not ones based purely on interaction, but on value. Many of the current social mapping tools measure membership and subscription, not necessarily the value of participation. All of this forms part of a wider exploration of how the social structure of the organisation works: we have to put in the legwork to understand this, because without it, we are applying old rule sets in a new space, and that way will only lead to failure. I will be #WorkingOutLoud on the analysis of the research over the next 12 weeks or so. If you are interested, you can take part in the initial survey here. 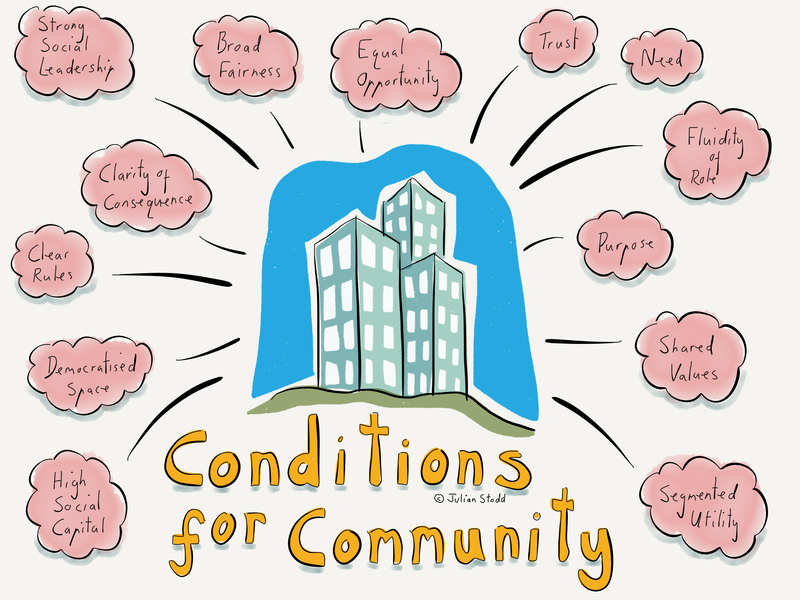 This entry was posted in Community and tagged Change, Community, Conditions for Community, Leadership, research. Bookmark the permalink.